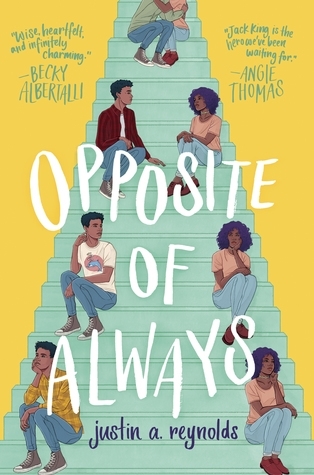 Today we're excited to chat with Justin Reynolds author of Opposite Of Always. Read on for more about Justin, an interview, plus an giveaway! Justin A. Reynolds has been a pest control operator, night security guard, steel mill janitor, NASA intern, salesman of high-end faucet fixtures, and carpet-flooring installer. He was most recently a registered nurse, before trading his stethoscope for a pencil, but he likes to think both instruments reveal the heart. He lives in northeast Ohio, home to snow, Lake Erie, and the Cavaliers. You can visit Justin at justinareynolds.com [justinareynolds.com]. This story stemmed from great personal loss. Two people who still mean the world to me passed away rather unexpectedly, and this story began as a series of questions that I desperately wanted/needed answers to: if I could see my dead loved ones again, who or what would I be willing to risk? If I could see them again (and that time was limited), what would I say, what would I ask them? Would it be fair to them—wanting them back here—when they’d have to die all over again? Good question! Honestly, to answer it, I feel sorta terrible, but okay. I think I’m going to go with Franny, because here’s a person with so much heartache in his life, and yet he is also possibly the most hopeful. The novel came first! I usually have a working title that doesn’t actually stick. The actual title, for me, comes later! Trust that your voice is enough. You don’t have to write like the people that you admire; your voice has its own power. I like that it tells the story of the book rather succinctly, and that depending on if you look at it from the top down, or vice versa, the narrative changes completely. Lots of new releases to look forward to in 2019! I’ll go with one that I’ve been in love with ever since I first heard about it: Let Me Hear a Rhyme by Tiffany D. Jackson! Look out for it for sure! I’m working on a few things, including a book that once more grapples with death, and how it affects the way we all choose to live—naturally, haha. My super power is convincing myself that I work better when I’ve waited until the last possible moment to start working, haha. It’s a pretty cool power! Sarah Henning recommended this book on Instagram and then I saw that it has a special release at Target! Very excited to read!!! I love the cover. It's lighthearted and makes me think of friendship. I wish the summary didn't have so much info, though! I really like the cover and the book sounds interesting. Thank you author for the diversity representation! I adore the cover and the synopsis already got me hooked. Can't wait to read this! This story sounds heart wrenching and beautiful! Wow, this book its going to be sad I can tell, but I'm looking forward to it ? This book sounds fantastic and this cover is perfect. The cover really fits the story. I like books about the consequences of time travel. This book sounds really emotional.